Neoplasms that arise in the salivary glands are relatively rare, yet they represent a wide variety of both benign and malignant histologic subtypes as seen in the image below. Although researchers have learned much from the study of this diverse group of tumors over the years, the diagnosis and treatment of salivary gland neoplasms remain complex and challenging problems for the head and neck surgeon. 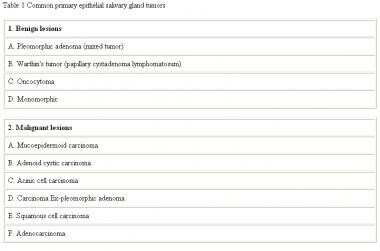 Some common salivary gland neoplasms are listed in the table below. Salivary gland neoplasms most commonly appear in the sixth decade of life. Patients with malignant lesions typically present after age 60 years, whereas those with benign lesions usually present when older than 40 years. (In children and adolescents, salivary gland tumors make up 0.5% of all malignancies. [4, 5] ) Benign neoplasms occur more frequently in women than in men, but malignant tumors are distributed equally between the sexes. The salivary glands are divided into 2 groups: the major salivary glands and the minor salivary glands. The major salivary glands consist of the following 3 pairs of glands: the parotid glands, the submandibular glands, and the sublingual glands. The minor salivary glands comprise 600-1000 small glands distributed throughout the upper aerodigestive tract. Among salivary gland neoplasms, 80% arise in the parotid glands, 10-15% arise in the submandibular glands, and the remainder arise in the sublingual and minor salivary glands. Most series report that about 80% of parotid neoplasms are benign, with the relative proportion of malignancy increasing in the smaller glands. A useful rule of thumb is the 25/50/75 rule. That is, as the size of the gland decreases, the incidence of malignancy of a tumor in the gland increases in approximately these proportions. The most common tumor of the parotid gland is the pleomorphic adenoma, which represents about 60% of all parotid neoplasms, as seen in the table below. Almost half of all submandibular gland neoplasms and most sublingual and minor salivary gland tumors are malignant. The relative proportion of submandibular tumors is shown in the table below. Salivary gland neoplasms are rare in children. Most tumors (65%) are benign, with hemangiomas being the most common, followed by pleomorphic adenomas. In children, 35% of salivary gland neoplasms are malignant. Mucoepidermoid carcinoma is the most common salivary gland malignancy in children. Successful diagnosis and treatment of patients with salivary gland tumors require a thorough understanding of tumor etiology, biologic behavior of each tumor type, and salivary gland anatomy. Computed tomography (CT) scanning or magnetic resonance imaging (MRI) is useful for determining the extent of large tumors, for evaluating extraglandular extension, for determining the actual depth of parotid tumors, and for discovering other tumors in one gland or in the contralateral gland. Additionally, CT scanning and MRI are helpful in distinguishing an intraparotid deep-lobe tumor from a parapharyngeal space tumor and for evaluation of cervical lymph nodes for metastasis. CT scanning and MRI can be used to predict possible malignancy based on observation of poorly defined tumor margins; MRI is the better of the two for this purpose. Ultrasonography may be able to reveal the type of tumor,  and ultrasonographic contrast mediums can demonstrate the vascularity of the tumor before surgery. In addition, ultrasonography can guide fine-needle aspiration to increase the likelihood of getting a good sample, and it can precisely guide core needle biopsies 97% of the time in an outpatient setting, lessening the need for intraoperative biopsies. Ultrasonography can also guide automated core biopsy systems with a sensitivity of 75%, specificity of 96.6%, and accuracy of 91.9%. F-18 fluorodeoxyglucose positron emission tomography (FDG-PET) scanning can be used to plan treatment of salivary gland malignancies by detecting lymph node metastases that require a neck dissection or by finding distant metastases that may not have caused abnormalities in routine blood work. This is most useful when combined with CT scanning. Technetium-99m (Tc-99m) pertechnetate scintigraphy with lemon juice stimulation can be used to diagnose Warthin tumors with correlation between tumor size and Tc-99m uptake. In general, salivary gland neoplasms respond poorly to chemotherapy, and adjuvant chemotherapy is currently indicated only for palliation. Carefully planned and executed surgical excision is the primary treatment for all primary salivary gland tumors. The principles of surgery vary with the site of origin. Superficial parotidectomy with identification and dissection of the facial nerve is the minimum operation for diagnosis and treatment of parotid masses. Surgery is the primary treatment for malignant tumors of the salivary glands. This is often combined with postoperative radiation therapy, depending on the specific tumor characteristics and stage. The extent of surgery is based on the size of the tumor, local extension, and neck metastases. The facial nerve is spared unless it is directly involved. For patient education information, visit eMedicineHealth's Cancer Center. Also, see Cancer of the Mouth and Throat. The etiology of salivary gland neoplasms is not fully understood. Two theories predominate: the bicellular stem cell theory and the multicellular theory. This theory holds that tumors arise from 1 of 2 undifferentiated stem cells: the excretory duct reserve cell or the intercalated duct reserve cell. Excretory stem cells give rise to squamous cell and mucoepidermoid carcinomas, while intercalated stem cells give rise to pleomorphic adenomas, oncocytomas, adenoid cystic carcinomas, adenocarcinomas, and acinic cell carcinomas. In the multicellular theory, each tumor type is associated with a specific differentiated cell of origin within the salivary gland unit. Squamous cell carcinomas arise from excretory duct cells, pleomorphic adenomas arise from the intercalated duct cells, oncocytomas arise from the striated duct cells, and acinic cell carcinomas arise from acinar cells. Recent evidence suggests that the bicellular stem cell theory is the more probable etiology of salivary gland neoplasms. This theory more logically explains neoplasms that contain multiple discrete cell types, such as pleomorphic adenomas and Warthin tumors. Radiation therapy in low doses has been associated with the development of parotid neoplasms 15-20 years after treatment. After therapy, the incidence of pleomorphic adenomas, mucoepidermoid carcinomas, and squamous cell carcinomas is increased. As with most cancers, the exact molecular mechanism by which tumorigenesis occurs in salivary gland neoplasms is incompletely understood. Multiple pathways and oncogenes have been implicated, including oncogenes that are known to be associated with a wide variety of human cancers. These include p53, Bcl-2, PI3K/Akt, MDM2, and ras. Seventy percent of pleomorphic adenomas have associated chromosomal rearrangements. The most common is a rearrangement of 8q12, occurring in 39% of pleomorphic adenomas. The target gene at this locus is PLAG1, which encodes a zinc finger transcription factor. The other target gene is HMGA2, which encodes a nonhistone chromosomal high mobility group protein that is involved in structural regulation of the chromosome and transcription. This gene is located at 12q13-15. Because these rearrangements are unique to pleomorphic adenomas amongst salivary gland neoplasms, interrogation of these rearrangements by RT-PCR or FISH may aid in diagnosis. CD117 or c-kit is a tyrosine kinase receptor that is found in adenoid cystic carcinoma, myoepithelial carcinoma, and lymphoepitheliomalike carcinoma. CD117 expression is able to reliably differentiate ACC from polymorphous low-grade adenocarcinoma, and small molecule inhibitors of this receptor are currently being studied as a potential therapeutic agent. Other salivary gland neoplasms have been associated with overexpressed beta-catenin through abnormal Wnt signaling. Adenoid cystic carcinoma with mutations in CTNNB1 (b-catenin gene), AXIN1 (axis inhibition protein 1), and APC (adenomatosis polyposis coli tumor suppressor) show tumorigenesis via this process. Promoter methylation is known to develop tumors by inactivating tumor suppressor genes. Mutations that cause hypermethylation and downregulation of 14-3-3ó, a target gene for p53 in the Gap2/mitosis (G2/M) cell cycle checkpoint, was found to be extensive in adenoid cystic carcinoma (ACC). The methylation of genes that control apoptosis and DNA repair were also found in ACC, especially in high-grade tumors. Chromosomal loss has been found to be an important cause of mutations and tumorigenesis in salivary gland tumors. Allelic loss of chromosomal arm 19q has been reported to occur commonly in adenoid cystic carcinoma. Mucoepidermoid carcinomas also show the loss of chromosomal arms 2q, 5p, 12p, and 16q more than 50% of the time. Multiple other genes are being investigated in the tumorigenesis of salivary gland neoplasms. Hepatocyte growth factor (HGF), a protein that causes morphogenesis and dispersion of epithelial cells, has been found to increase adenoid cystic carcinoma scattering and perhaps invasiveness. Expression of proliferating cell nuclear antigen (PCNA) was found in the 2 most common malignant salivary tumors, mucoepidermoid carcinomas and adenoid cystic carcinomas, with higher expression in submandibular gland—derived malignancies. Overexpression of fibroblast growth factor 8b has been shown to lead to salivary gland tumors in transgenic mice. Newer research in salivary gland neoplasms is focusing on factors that increase tumor invasion and spread. Matrix metalloproteinase-1, tenascin-C, and beta-6 integrin have been found to be associated with benign tumor expansion and tissue invasion by malignant tumors. In adenoid cystic carcinoma, increased immunoreactivity for nerve growth factor and tyrosine kinase A has been correlated with perineural invasion. Taking a thorough history is important in treating patients with suspected salivary gland neoplasms. A diverse variety of pathologic processes, including infectious, autoimmune, and inflammatory diseases, can affect the salivary glands and may masquerade as neoplasms. Although most masses of the parotid gland are ultimately diagnosed as true neoplasms, submandibular gland enlargement is most commonly secondary to chronic inflammation and calculi. Initial history taking should focus on the presentation of the mass, growth rate, changes in size or symptoms with meals, facial weakness or asymmetry, and associated pain. A thorough general history provides insight into possible inflammatory, infectious, or autoimmune etiologies. Most patients with salivary gland neoplasms present with a slowly enlarging painless mass. A discrete mass in an otherwise normal-appearing gland is the norm for parotid gland neoplasms. Parotid neoplasms most commonly occur in the tail of the gland. Submandibular neoplasms often appear with diffuse enlargement of the gland, whereas sublingual tumors produce a palpable fullness in the floor of the mouth. Minor salivary gland tumors have a varied presentation, depending on the site of origin. Painless masses on the palate or floor of mouth are the most common presentation of minor salivary neoplasm. Laryngeal salivary gland neoplasms may produce airway obstruction, dysphagia, or hoarseness. Minor salivary tumors of the nasal cavity or paranasal sinus can manifest with nasal obstruction or sinusitis. Lateral pharyngeal wall protrusions with resultant dysphagia and muffled voice should raise suspicion of a parapharyngeal space neoplasm. Facial paralysis or other neurologic deficit associated with a salivary gland mass indicates malignancy. The significance of painful salivary gland masses is not entirely clear. Pain may be a feature associated with both benign and malignant tumors. Pain may arise from suppuration or hemorrhage into a mass or from infiltration of a malignancy into adjacent tissue. Physical examination of salivary gland masses should occur in the context of a thorough general head and neck examination. Note the size, mobility, and extent of the mass, as well as its fixation to surrounding structures and any tenderness. Perform bimanual palpation of the lateral pharyngeal wall for deep lobe parotid tumors to assess for parapharyngeal space extension. Bimanual palpation for submandibular and sublingual masses also reveals the extent of the mass and its fixation to surrounding structures. Pay attention to surrounding skin and mucosal sites, which drain to the parotid and submandibular lymphatics. Regional metastases from skin or mucosal malignancies may manifest as salivary gland masses. Also, the cervical lymph node basin should be palpated to assess for metastatic disease from a primary lesion of the salivary glands. CN VII should be assessed carefully to identify any weakness or paralysis. Facial nerve palsy usually indicates a malignant lesion with infiltration into the nerve. The salivary glands begin to form at 6-9 weeks’ gestation. The major salivary glands arise from ectodermal tissue. The minor salivary glands arise from either ectodermal or endodermal tissue, depending on their location. Development of each salivary gland begins with ingrowth of tissue from oral epithelium, initially forming solid nests. Later differentiation leads to tubule formation with 2 layers of epithelial cells, which differentiate to form ducts, acini, and myoepithelial cells. Embryologically, the submandibular gland forms earlier than does the parotid gland. The resulting associated lymph nodes are outside the gland. The parotid gland becomes encapsulated later in its embryology. This leads to lymph nodes, which are trapped within the gland. Most of the nodes, 11 on average, are located in the superficial portion of the gland, and the rest, 2 on average, are in the deep portion. This embryologic difference explains why lymphatic metastases may manifest within the substance of the parotid gland and not the submandibular gland. Salivary glands are made up of acini and ducts. The acini contain cells that secrete mucus, serum, or both. These cells drain first into the intercalated duct, followed by the striated duct, and finally into the excretory duct. Myoepithelial cells surround the acini and intercalated duct and serve to expel secretory products into the ductal system. Basal cells along the salivary gland unit replace damaged or turned-over elements. The parotid gland acini contain predominately serous cells, while the submandibular gland acini are mixed, containing both mucous and serous cells, and the sublingual and minor salivary glands have predominately mucous acini. The parotid gland is the largest of the salivary glands. It is located in a compartment anterior to the ear and is invested by fascia that suspends the gland from the zygomatic arch. The parotid compartment contains the parotid gland, nerves, blood vessels, and lymphatic vessels, along with the gland itself. The compartment may be divided into superficial, middle, and deep portions for describing the contents, but the space has no discrete anatomic divisions. The superficial portion contains the facial nerve, great auricular nerve, and auriculotemporal nerve. The middle portion contains the superficial temporal vein, which unites with the internal maxillary vein to form the posterior facial vein. The deep portion contains the external carotid artery, the internal maxillary artery, and the superficial temporal artery. The parotid compartment is a wedge-shaped 3-dimensional area with superior, anterior diagonal, posterior diagonal, and deep borders. It is bounded superiorly by the zygomatic arch; anteriorly by the masseter muscle, lateral pterygoid muscle, and mandibular ramus; and inferiorly by the sternocleidomastoid muscle and the posterior belly of the digastric muscle. The deep portion lies lateral to the parapharyngeal space, styloid process, stylomandibular ligament, and carotid sheath. The deep anatomic relationship is important because tumors may arise in the deep portion and grow into the parapharyngeal space and may manifest as intraoral masses. These tumors are termed dumbbell tumors when they grow between the posterior aspect of the mandibular ramus and the stylomandibular ligament. This position causes a narrow constricted portion with larger unrestricted portions on either side, forming a dumbbell shape. Tumors that pass posterior to the stylomandibular ligament into the parapharyngeal space, forming unrestricted round masses, are called round tumors. The parotid is a unilobular gland through which the facial nerve passes. No true superficial and deep lobes exist. The term superficial parotidectomy or parotid lobectomy refers only to the surgically created boundary from facial nerve dissection. The Stensen duct drains the parotid gland. Initially, it is located approximately 1 cm below the zygoma and runs horizontally. It passes anteriorly to the masseter muscle and then penetrates the buccinator muscle to open intraorally opposite the second maxillary molar. The facial nerve exits the skull via the stylomastoid foramen located immediately posterior to the base of the styloid process and anterior to the attachment of the digastric muscle to the mastoid tip at the digastric ridge. The nerve travels anteriorly and laterally to enter the parotid gland. Branches of the facial nerve that innervate the posterior auricular muscle, posterior digastric muscle, and stylohyoid muscle arise before the nerve enters the parotid gland. Just after entering the parotid gland, it divides into 2 major divisions: the upper and lower divisions. This branch point is referred to as the pes anserinus. Subsequent branching is variable, but the nerve generally forms 5 branches. The buccal, marginal mandibular, and cervical branches arise from the lower division. The zygomatic and temporal branches arise from the upper division. Branches of the external carotid artery provide arterial supply to the parotid gland. The posterior facial vein provides venous drainage, and lymphatic drainage is from lymph nodes within and external to the gland that leads to the deep jugular lymphatic chain. The gland receives parasympathetic secretomotor innervation from preganglionic fibers that arise in the inferior salivatory nucleus. These fibers travel with the glossopharyngeal nerve to exit the skull via the jugular foramen. They then leave the glossopharyngeal nerve as the Jacobson nerve and reenter the skull via the inferior tympanic canaliculus. The fibers traverse the middle ear space broadly over the promontory of the cochlea (tympanic plexus) and exit the temporal bone superiorly as the lesser petrosal nerve. The lesser petrosal nerve exits the middle cranial fossa through the foramen ovale, where the preganglionic fibers synapse in the otic ganglion. The postganglionic fibers travel with the auriculotemporal nerve to supply the parotid gland. The submandibular glands are the second largest salivary glands, after the parotid. They are encapsulated glands located anterior and inferior to the angle of the mandible in the submandibular triangle formed from the anterior and posterior bellies of the digastric muscle and the inferior border of the mandible. The submandibular gland has a superficial portion located lateral to the mylohyoid and a deep portion located between the mylohyoid and the hyoglossus. The marginal mandibular branch of the facial nerve and the anterior facial vein pass superficially to the gland. Posteriorly, the gland is separated from the parotid gland by the stylomandibular ligament. The facial artery crosses the deep portion of the gland. The Wharton duct drains the gland. It passes between the mylohyoid and hyoglossus muscles and along the genioglossus muscle to enter the oral cavity lateral to the lingual frenulum. The lingual nerve and submandibular ganglion are located superior to the submandibular gland and deep to the mylohyoid muscle. The hypoglossal nerve lies deep to the gland and inferior to the Wharton duct. Arterial blood supply is from the lingual and facial arteries. The anterior facial vein provides venous drainage. The lymphatic drainage is to the submandibular nodes and then to the deep jugular chain. The submandibular and sublingual glands receive parasympathetic secretomotor innervation from preganglionic fibers, which originate in the superior salivatory nucleus. These fibers leave the brainstem as the nervus intermedius to join with the facial nerve. They then leave the facial nerve with the chorda tympani to synapse in the submandibular ganglion. Postganglionic fibers innervate the submandibular and sublingual glands. The sublingual glands are the smallest of the major salivary glands. Unlike the parotid and submandibular gland, the sublingual gland is unencapsulated. Each gland lies medial to the mandibular body, just above the mylohyoid muscle and deep to the mucosa of the mouth floor. Rather than 1 major duct, the sublingual glands have 8-20 small ducts, which penetrate the floor of mouth mucosa to enter the oral cavity laterally and posteriorly to the Wharton duct. Arterial supply is from the lingual artery. Lymphatic drainage is to the submental and submandibular lymph nodes, then to the deep cervical lymph nodes. Innervation is via the same pathway as the submandibular gland. Approximately 600-1000 minor salivary glands are located throughout the paranasal sinuses, nasal cavity, oral mucosa, hard palate, soft palate, pharynx, and larynx. Each gland is a discrete unit with its own duct opening into the oral cavity. Together, the salivary glands produce 1-1.5 L of saliva per day. About 45% is produced by the parotid gland, 45% by the submandibular glands, and 5% each by the sublingual and minor salivary glands. Saliva is produced at a low basal rate throughout the day, with a 10-fold increase in flow during meals. Saliva functions to maintain lubrication of the mucous membranes and to clear food, cellular debris, and bacteria from the oral cavity. Saliva contains salivary amylase, which assists in initial digestion of food. Saliva forms a protective film for the teeth and prevents dental caries and enamel breakdown, which occur in the absence of saliva. Also, by virtue of production of lysozyme and immunoglobulin A in the salivary glands, saliva plays an antimicrobial role against bacteria and viruses in the oral cavity. Stenner M, Klussmann JP. Current update on established and novel biomarkers in salivary gland carcinoma pathology and the molecular pathways involved. Eur Arch Otorhinolaryngol. 2009 Mar. 266(3):333-41. [Medline]. Pinkston JA, Cole P. Incidence rates of salivary gland tumors: results from a population-based study. Otolaryngol Head Neck Surg. 1999 Jun. 120 (6):834-40. [Medline]. American Cancer Society. What Are the Key Statistics About Salivary Gland Cancer?. Available at https://www.cancer.org/cancer/salivary-gland-cancer/about/what-is-key-statistics.html. Accessed: 2017 Apr 27. PDQ Pediatric Treatment Editorial Board. Childhood Salivary Gland Tumors Treatment (PDQ®): Health Professional Version. PDQ Cancer Information Summaries. 2019 Jan 31. [Medline]. [Full Text]. PDQ Pediatric Treatment Editorial Board. Unusual Cancers of Childhood Treatment (PDQ®): Health Professional Version. PDQ Cancer Information Summaries. 2019 Jan 31. [Medline]. [Full Text]. Alvi S, Limaiem F. Cancer, Parotid. StatPearls. 2019 Jan. [Medline]. [Full Text]. Valstar MH, de Ridder M, van den Broek EC, et al. Salivary gland pleomorphic adenoma in the Netherlands: A nationwide observational study of primary tumor incidence, malignant transformation, recurrence, and risk factors for recurrence. Oral Oncol. 2017 Mar. 66:93-9. [Medline]. Yuan WH, Hsu HC, Chou YH, Hsueh HC, Tseng TK, Tiu CM. Gray-scale and color Doppler ultrasonographic features of pleomorphic adenoma and Warthin's tumor in major salivary glands. Clin Imaging. 2009 Sep-Oct. 33(5):348-53. [Medline]. Straif K, Weiland SK, Bungers M, Holthenrich D, Keil U. Exposure to nitrosamines and mortality from salivary gland cancer among rubber workers. Epidemiology. 1999 Nov. 10(6):786-7. [Medline]. Zheng W, Shu XO, Ji BT, Gao YT. Diet and other risk factors for cancer of the salivary glands:a population-based case-control study. Int J Cancer. 1996 Jul 17. 67(2):194-8. [Medline]. Elledge R. Current concepts in research related to oncogenes implicated in salivary gland tumourigenesis: a review of the literature. Oral Dis. 2009 May. 15(4):249-54. [Medline]. Cheuk W, Chan JK. Advances in salivary gland pathology. Histopathology. 2007 Jul. 51(1):1-20. [Medline]. Mamlouk MD, Rosbe KW, Glastonbury CM. Paediatric parotid neoplasms: a 10 year retrospective imaging and pathology review of these rare tumours. Clin Radiol. 2015 Mar. 70(3):270-7. [Medline]. Rong X, Zhu Q, Ji H, et al. Differentiation of pleomorphic adenoma and Warthin's tumor of the parotid gland: ultrasonographic features. Acta Radiol. 2014 Dec. 55(10):1203-9. [Medline]. de Morais EF, Pinheiro JC, Sena DAC, et al. Extracapsular invasion: a potential prognostic marker for carcinoma ex-pleomorphic adenoma of the salivary glands? A systematic review. J Oral Pathol Med. 2019 Feb 13. [Medline]. Adeyemi BF, Kolude BM, Akang EE, Lawoyin JO. A study of the utility of silver nucleolar organizer regions in categorization and prognosis of salivary gland tumors. Oral Surg Oral Med Oral Pathol Oral Radiol Endod. 2006 Oct. 102(4):513-20. [Medline]. Skalova A, Sima R, Kaspirkova-Nemcova J, et al. Cribriform Adenocarcinoma of Minor Salivary Gland Origin Principally Affecting the Tongue: Characterization of New Entity. Am J Surg Pathol. 2011 Aug. 35(8):1168-1176. [Medline]. Jaehne M, Roeser K, Jaekel T, Schepers JD, Albert N, Loning T. Clinical and immunohistologic typing of salivary duct carcinoma: a report of 50 cases. Cancer. 2005 Jun 15. 103(12):2526-33. [Medline]. Aro K, Ho AS, Luu M, et al. Survival Impact of Adjuvant Therapy in Salivary Gland Cancers following Resection and Neck Dissection. Otolaryngol Head Neck Surg. 2019 Feb 5. 194599819827851. [Medline]. Johnson JT, Ferlito A, Fagan JJ, Bradley PJ, Rinaldo A. Role of limited parotidectomy in management of pleomorphic adenoma. J Laryngol Otol. 2007 Dec. 121(12):1126-8. [Medline]. Israel Y, Rachmiel A, Gourevich K, Nagler R. Survival Probabilities Related to Histology, Grade and Stage in Patients With Salivary Gland Tumors. Anticancer Res. 2019 Feb. 39 (2):641-7. [Medline]. Kim WS, Lee HS, Park YM, et al. Surgical Outcomes of Parotid Cancer: A 10-Year Experience. Otolaryngol Head Neck Surg. 2012 Aug. 147(2 suppl):P180-P181. [Medline]. Eneroth CM, Hamberger CA. Principles of treatment of different types of parotid tumors. Laryngoscope. 1974 Oct. 84(10):1732-40. [Medline]. Terhaard CH, Lubsen H, Van der Tweel I, et al. Salivary gland carcinoma: independent prognostic factors for locoregional control, distant metastases, and overall survival: results of the Dutch head and neck oncology cooperative group. Head Neck. 2004 Aug. 26(8):681-92; discussion 692-3. [Medline]. Wax MK, Kaylie DM. Does a positive neural margin affect outcome in facial nerve grafting?. Head Neck. 2007 Jun. 29(6):546-9. [Medline]. Magnano M, gervasio CF, Cravero L, et al. Treatment of malignant neoplasms of the parotid gland. Otolaryngol Head Neck Surg. 1999 Nov. 121(5):627-32. [Medline]. Renehan AG, Gleave EN, Slevin NJ, McGurk M. Clinico-pathological and treatment-related factors influencing survival in parotid cancer. Br J Cancer. 1999 Jun. 80(8):1296-300. [Medline]. [Full Text]. Iseli TA, Karnell LH, Preston TW, et al. Facial nerve sacrifice and radiotherapy in parotid adenoid cystic carcinoma. Laryngoscope. 2008 Oct. 118(10):1781-6. [Medline]. Casler JD, Conley JJ. Surgical management of adenoid cystic carcinoma in the parotid gland. Otolaryngol Head Neck Surg. 1992 Apr. 106(4):332-8. [Medline]. American Joint Committee for Cancer Staging and End Result Reporting (AJCC) classification of major salivary gland malignancies. The authors and editors of Medscape Reference gratefully acknowledge the contributions of previous author Peter A Harri, MD, to the development and writing of this article.